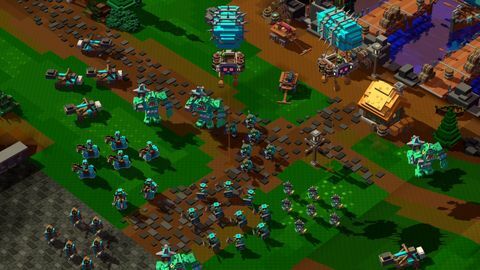 Ben summons an adorable horde in the latest RTS to make its way to consoles. As someone that exceeds even the increasingly ancient average age of gamers by [redacted] years, I can tell you some stories. I haven’t seen attack ships on fire off the shoulder of Orion, but I have gasped in horror as my humvee force charged up a rise and straight into a Nod obelisk of light in Command and Conquer, sent countless peons to their death before Warcraft even had a 2 on the end of it (let alone a World of in front of it), and even cursed at my screen as a random sand worm ate my last harvester in Dune 2. 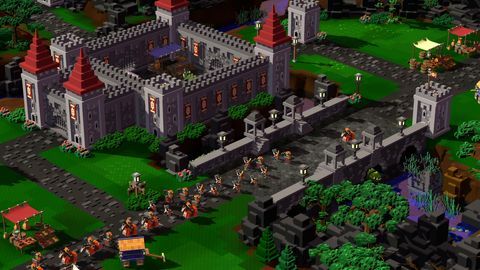 So I’m well-placed to try out 8-Bit Hordes, the newest iteration of the 8-Bit RTS titles from Petroglyph Games, which clearly aims to hark back to those heady early days of the genre, and has popped up with a PS4 version. 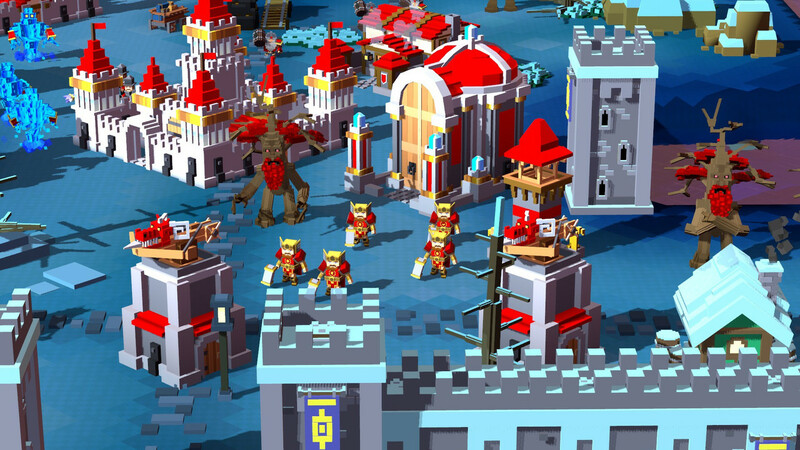 it’s all adorably rendered in the game’s Lego-esque signature art style. Swapping out the tanks and guns of 8-Bit Armies for dwarves and bows, 8-Bit Hordes takes place in your classical fantasy world, where the orc-y Deathsworn are locked in conflict with the knight-y Lightbringers. It’s a setting so generic - your goblin zeppelins, fire-breathing dragons bomb-hiffing dwarves are all here - that what there is of the game’s story basically makes jokes out of it. 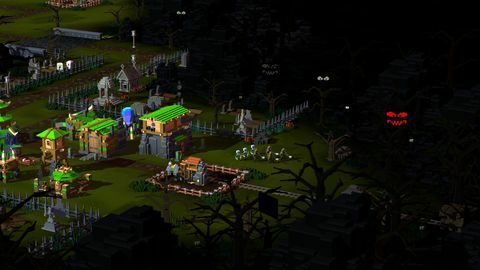 But it’s all adorably rendered in the game’s Lego-esque signature art style, with each map stuffed with all manner of blocky wee medieval villages, spooky woods, and tentacle monsters. It’s a treat to look at and there are little visual Easter eggs all over the place, and it’s thus huuuuugely frustrating that the PS version seems to lack a zoom option to go in to take a closer look at stuff. An epic fantasy score presented in chiptune also adds to the retro-ambience. 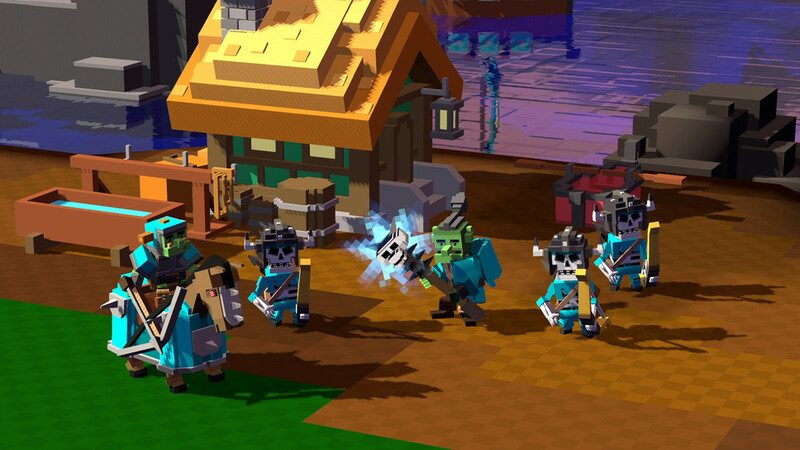 this is all about who can build and smash their horde against their enemy’s defences fastest, biggest, and hardest. 8-Bit Hordes aims to keep things simple, and classic; units come as infantry, ranged, or flyers, and although there are varieties within each class (as ranged units for example, dwarves do more structure damage, and rangers have elementary stealth), battles come down to the rock-paper-scissors of these classes. Knowing this, and in a handy workaround to the control problems faced by RTS players on consoles, Polygraph hand the circle, square and triangle buttons over to tagging your armies, letting you build each troop under one of the three labels. It means there’s basically no fiddling around with trying to control individual units - you’ll spend most of your time grabbing your army in lots of about 10-40 and throwing them at things. While it’s not the most subtle strategy gameplay going, it’s clearly not supposed to be; your harvester units set about their business automatically, tech/unit trees are simple and carefully introduced (perhaps too carefully), and terrain is easily navigated; this is all about who can build and smash their horde against their enemy’s defences fastest, biggest, and hardest. you’ll need to get up close to your TV and squint if you want to decrypt some of the unit descriptions and information. If it all sounds a bit simplistic, well, it is. But it also provides some casual fun. Rampaging with your massive army - yep, this is a horde alright - across the chunky landscape is enjoyable, and despite the relative simplicity of the action, you will need to moderate your tactics in the campaigns. They take a sharp upturn in difficulty towards the end, putting you on the defensive against multiple enemy camps and forced to fight long-running battles towards further gold sources. And a human opponent, as always, will bring entirely new levels of deviousness (if you can find one online, which was very difficult in our timezone over the review period). A skirmish mode and medal challenges also offer a bit of replay value. There are a few things dragging things down, though. “Readable text” sadly died on the trail during the game’s journey from the PC, and you’ll need to get up close to your TV and squint if you want to decrypt some of the unit descriptions and information. The game’s ambient music also has a bit of a tendency to glitch out and suddenly cut off or just not really work properly. And although the maps are bursting with visual invention, apart from occasionally finding some bonus units in treasure chests, there’s not a lot of incentive to explore them. Your own tactics almost always come down to “smash straight up the middle” and resource sources are only rarely contested by the AI (who similarly, seems to have trained at a WWI officer’s camp, and hopes to block your outgoing defensive fire with a wall of the corpses of his own troops). Ultimately though, the pick-up-and-play simplicity of the strategy here is just “1.1M NO DIVING”-shallow, and it’s hard to see RTS buffs jumping in wholeheartedly without cracking their tailbone and limping off swearing to find something deeper. Ups Visuals are an inventively retro treat. Fast-paced and at times challenging. Controls optimised relatively well for console. Easy to pick up and play in short fun bursts. Downs Not a lot of strategic nuance or depth. Some quality-of-life letdowns in conversion from PC, like no zoom and poor text legibility. Music hitches. 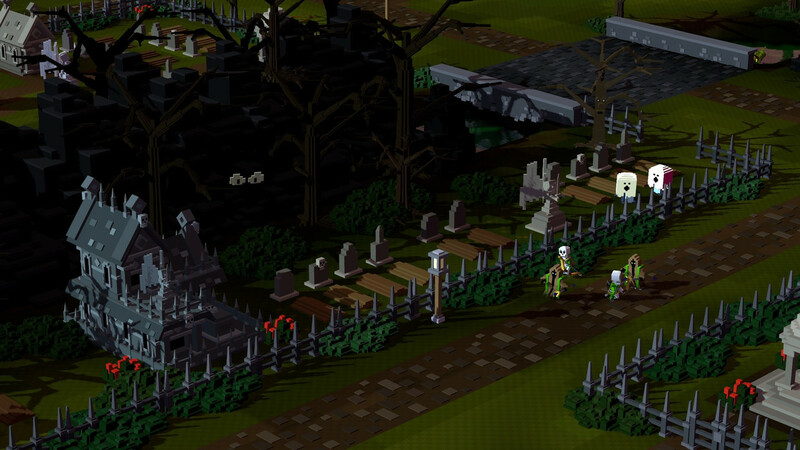 Story has some amusements but is ultra-bare-bones.